Palms are an extremely versatile plant that can adapt to many situations. The ornamental appeal, shade benefits, and durability make them one of the worlds most sort after plants. Their huge green leaf area indicates massive amounts chlorophyll molecules to which the health of the plant depends. Chlorophyll consists of Carbon, Hydrogen, Oxygen, Nitrogen with Magnesium central to the chlorophyll molecule. ways compared to other ornamental plants. Some nutritional problems in palms are difficult to diagnose accurately because symptoms of several different mineral deficiencies may overlap. Many conventional palm fertilisers contain high nitrogen inputs that may create soil imbalances. 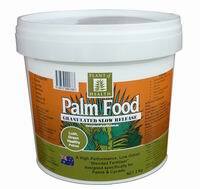 Our granulated PALM FOOD is a sophisticated product that supports both the plant nutrition as well as the soil nutrition in which they grow. The no pong formula make is perfect for both indoor and outdoor use as well as around pools, entertainment areas resorts and hotels. Repeat monthly or as required. Do not apply to exposed roots.